Everyone knows the damage that moths can do to soft furnishings and clothing though fewer people are aware that there are three different varieties of what we generally just call “clothes moths”. 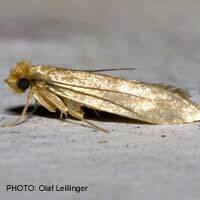 Eating a range of natural fibres, caterpillars of the Brown House Moth, White-Shouldered House Moth and, of course the “true” Clothes Moth can be serious household pests, especially in large numbers. Destructive as these insects are, they are not the only ones to threaten your upholstery, though the other main culprits – Carpet Beetles, Fur Beetles and the Case-Bearing Moth – are much less familiar. The larvae are naturally found in the nests of birds and mice and many infestations are traced back to somewhere in the building, in which the original insect first laid her eggs. The next generation of adults emerge, mate and some may find their way into the house itself, lay their eggs on the carpet, before attempting to go in search of nectar. Often the first clue of what is going on is their dead bodies on the window-sills when they fail to find a way out. Their offspring, however, will repeat the cycle, producing a self-sustaining infestation. As well as floor coverings, the larvae can attack clothes, leather, furs and animal skins. In museums too they can be a serious pest, posing a major threat to collections of fabrics, rugs, stuffed animal exhibits and butterfly collections. The first step in controlling them is to remove and destroy heavily infested items and then vacuum the area thoroughly – emptying the contents outside – to break the immediate cycle. It is also a good idea to try to locate the original source – perhaps a bird’s nest in the loft space, or mouse nest under the floorboards – and dispose of it, dusting the area with a suitable powder. Lifting carpets and dusting underneath them can also be effective, but subsequent vacuuming can remove the powder, so it may need topping up, especially if the infestation is a large one. Areas which cannot be treated by dusting and any gaps which could permit entry to incoming adults can be sprayed with long-lasting residual insecticide. If the beetles are well established, it is a good idea to re-treat in 2 – 3 weeks, assuming no adults or larvae force an earlier date by putting in an unexpected appearance. The Fur Beetle is very similar to the previous pest, except that at 5–6 mm long, it is a little larger and has one white spot on each side of its body. The larvae closely resemble the grubs of the carpet beetle but are slightly larger with a more banded appearance; their hairs are golden rather than brown and their tail bristles are orange-red in colour. It is once again the young that do the damage and, although as their name suggest, they do eat furs, they will also happily feast on a variety of natural fibres and even stored grain. The same general control regime as used against the Carpet Beetles should be effective against this species too. The Case-Bearing Moth is less commonly encountered than the usual kinds of clothes moths. It gets its name from the silken case that the caterpillars make as homes for themselves, usually the same colour as the fabric they are eating and which they carry around. In heavy infestations, the 10mm long larvae may be seen climbing up the walls, pulling their cases along behind them. Treatment involves residual insecticides dusts and sprays; though fumigation can be very effective where these cannot be used, mini fumers are proving very successful especially in lofts or large store rooms. Aromatic red cedar wood products can also be used in wardrobes and drawers, the aroma being a natural insect repellent. A range of state-of-the-art modern traps have also been developed using chemicals called “pheromones”, which mimic the natural smell of a female moth and lure male moths to their doom. Prevention is almost always easier than cure – so cleanliness and good housekeeping are of great importance in protecting your fabrics and soft furnishings from the ravages of these little known but very destructive pests. However, if this fails, then prompt action is called for and recognising your enemy is a key part of deciding what to do next.